The skull of a mammoth - possibly roaming the planet 13,000 years ago - was unearthed from an eroding stream in the Santa Rosa Island at Channel Islands National Park. Burrowed in the stream bank, the “exceptionally well-preserved fossil” with tusks is a rare find, especially because it would indicate the mammoth roamed the islands at nearly the same time as humans. “I have seen a lot of mammoth skulls and this is one of the best preserved I have ever seen,” paleontologist Justin Wilkins said in a statement. Wilkins, who works at the South Dakota-based Mammoth Site, said the discovery is “of high scientific importance.” Wilkins, retired National Park Service archaeologist Don Morris and preparator Monica Bugbee painstakingly excavated the fossil from layers of dirt. Charcoal samples near the complete skull date 13,000 years, which overlaps with the age of the oldest human skeletal remains in North America. The Arlington Springs Man’s remains were found on the Santa Rosa Island in 1959 and indicated that people lived there some 13,000 years ago. Named after the site the remains were found, scientists analyzed bone protein and radiocarbon dating to determine the age. The mammoth fossil was first discovered in September 2014. National Park Service biologist Peter Larramendy was surveying the area for a stream study when he observed an ivory tusk bulging from the gravel wall of the canyon. Scientists named the fossil Larry after Larramendy and one of world’s leading paleontologists, Larry Agenbroad, who died in 2014. The size of the find has left the scientists puzzled because they can’t determine if it’s a Columbian or pygmy mammoth, according to the park. 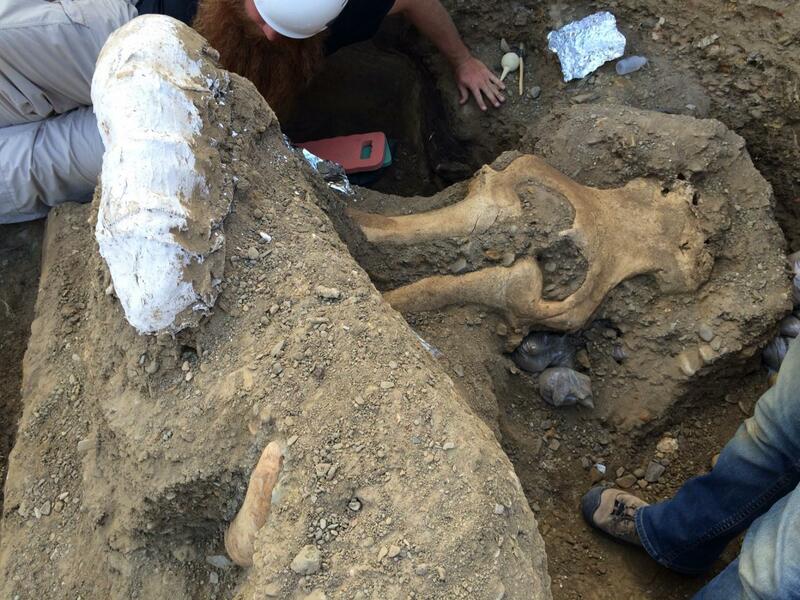 It’s possible the fossil could be an intermediate-sized or young Columbian mammoth, which are usually large. Columbian mammoths appeared in North America a million years after the first mammoths appeared on the continent. Sea levels were low when the Columbian mammoths moved to the Channel Islands in the last two ice ages. The land was also closer to the coast of the mainland. Known as Mammuthus exilis, their offspring was much shorter, downsizing from 14 feet to 6 feet. Even more baffling is the size of the fossil’s tusks. At 1.4 meters, the right tusk coils like an older mammoth. But the left tusk is shorter and sloped like that of a juvenile mammal. Scientists are working to measure the spacing, surface thickness and number of teeth in the fossil to determine when it died and what type of mammoth it was. Meanwhile, the team will cover the specimen with burlap and plaster to protect it. The scientists will then transport the fossil by helicopter and boat to the mainland. The mammoth will be taken to the Santa Barbara Museum of Natural History, so it can be carefully cleaned, preserved and studied. The fossil will be curated, so it can be displayed in the future.